7.7 Jap ammo, also known as the 7.7 Arisaka, is a 7.7 x 58 mm round designed for the Japanese military in 1939. The 7.7 Japanese was more powerful than the 6.5 Arisaka it was replacing. 7.7 Japanese rounds were chosen after the Japanese determined heavier machine gun cartridges were more effective in engagements with Chinese forces prior to World War II. The 7.7 Arisaka is ballistically similar to the American 30-06, which was the United States’ chosen cartridge in World War II. Japan produced numerous different loads for the 7.7 Arisaka outside of normal ball ammunition, including tracers, armor piercing, and even explosive and incendiary rounds. These round are extremely rare these days and possibly dangerous to fire so be sure to carefully examine these cartridges if you stumble upon any of them. Most of the 7.7 Jap chambered rifles out there are considered curio and relic rifles, and are popular with military surplus collectors. The round is still produced in full metal jacket variants, as well as the occasional production of soft point hunting loads. The Type 99 rifles can be found quite affordably, and are very common. 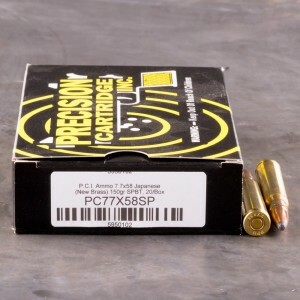 7.7 Jap ammo is an old cartridge, and since domestic production of weapons in this caliber was never done, the round has essentially never been upgraded. The 7.7 Japanese is still capable of firing a 202-grain bullet at 2,200 feet per second, with a comfortable amount of recoil for most shooters. It is great that Ammo To Go still offers these 7.7mm rounds. I love the product, it is just as advertised, very consistent in accuracy and penetration. Thanks for providing this great ammo for my vintage rifle. Hello, I'm a WW2 military rifle enthusiast that likes to sportarize rifles. Thanks to Ammo To Go I'm able to find ammo for my endeavors.